This election year, everything seems to be coming down to North Carolina. As a key swing state and a state where incumbent Senator Richard Burr is finding his footing somewhat shakily, the mountains, beaches, and pine-forested center of the state have seen more than their fair share of campaigning. And this shouldn't come as a surprise — North Carolina is a microcosm of the whole country's culture wars, so it makes sense that in such a heated election, everything is converging there. Elementary school students being taught about North Carolina's geography learn at a young age that it has everything: the rolling, smoky beauty of the Appalachians; wide, sandy beaches with warm water to swim in; the relatively flat and arable Piedmont region, perfect for agriculture. But the state also has everything when it comes to human geography. The big cities in North Carolina have flourished lately, even during the economic recession, with a number of them also showing up in lists of the America's smartest cities. It's experiencing an immigration boom, with over 10 percent of the workforce made up of immigrants — a number that's steadily growing — who are both streaming into the cities and making up a large proportion of the agricultural workforce. Over 70 percent of North Carolinians have expressed openness to immigration, and it hugely benefits the state's economy in myriad ways. On the other hand, as the cities have grown, the rural areas have become steadily more economically depressed. Poverty there is rampant and unemployment has been a big problem, especially with the disappearance of many manufacturing jobs. Electoral maps of North Carolina show deep blue splotches in a sea of red, but the makeup of the state legislature does not reflect the state's progressive side. Thanks to Republican control of the state legislature at the time of the last census, the state's congressional districts ended up heavily gerrymandered, and the cities found their electoral power diminished. Since then, the GOP-controlled state legislature, headed by Governor Pat McCrory, have taken a route of full-out attack against everything that the left holds dear. Cuts to education at all levels, including the state's fine university system, infuriated millions and bringing the Moral Mondays movement to North Carolina. In reaction to a resolution passed in Charlotte guaranteeing civil rights protections for the LGBTQ community, the Republican members of the legislature hurriedly pushed through HB2. This now nationally-infamous anti-transgender bill ignited a furor in the state, with numerous businesses canceling plans for expansion in the state and numerous events, including several college basketball tournaments at various levels (North Carolina as a whole is a veritable Mecca of college basketball), pledging to move elsewhere. Most pressingly for this election, however, has been the voter suppression, part of which a federal appeals court struck down as unfairly targeting minority communities "with almost surgical precision." The state's liberal population has tried to protest against these moves, but with things like reduced early voting, fewer polling places, and people actually getting removed from voter registration lists, the fight seems futile at times. Progressive moves like Charlotte's move to protect LGBTQ rights throw the state back into the past, and instead of stepping back like Mike Pence did when he saw the damage his "religious freedom" law was going to do to Indiana, Pat McCrory pushed forward. Things aren't looking great for Pat McCrory at the moment, which he probably should have expected when he did something that resulted in North Carolinians having their college basketball taken away from them. But the predicament of liberal North Carolina speaks for liberal America as a whole. The country needs progress — increased education funding and expanded civil rights and everything else — but it has to fight through barriers put up by people who don't speak for the majority. 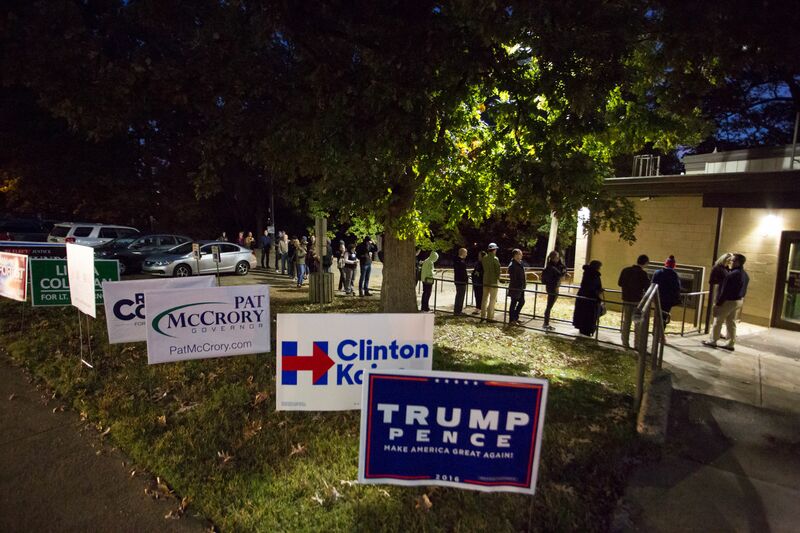 And now, North Carolina finds itself at the very crucible of the whole 2016 election. But which way will it go? Will the voter suppression have worked? Time will tell — and cities like Charlotte, Raleigh, and Durham can only hope that enough people across the country will have spoken up for progress.